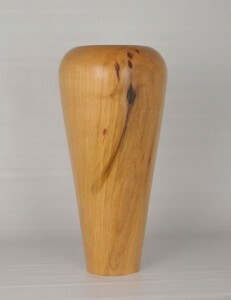 The Wormy cherry vase is 13″ tall and 5″ wide at the top. This is my first large vase after taking a course with Paul Ross of Chalet Woodcraft in Bloomfield Ontario. The wood came from a friend in Ottawa.